Isn’t this such a gorgeous colour combination? Pale peach and burgundy. I couldn’t resist choosing it for the hero image in today’s blog post. 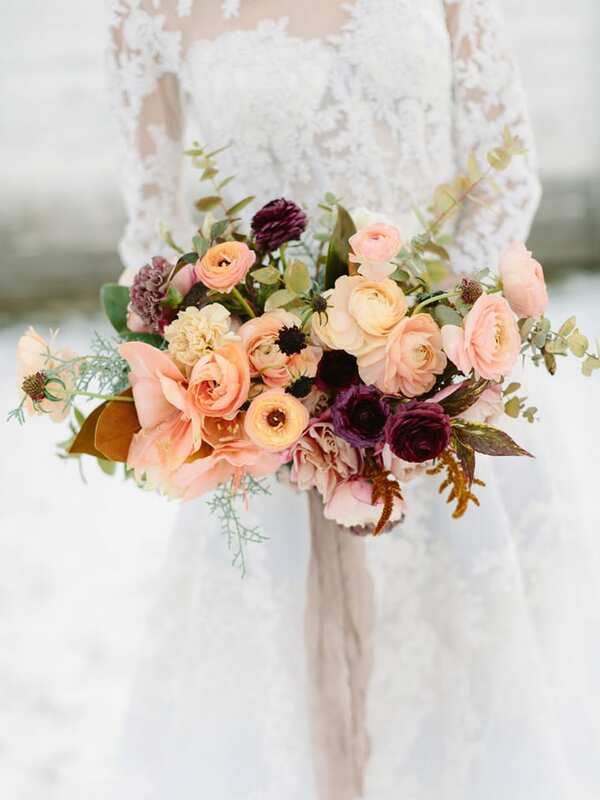 Created by Montana based florist Jennifer Horsley, founder of Habitat Floral Studio, for a winter wedding, it features ranunculus, amaryllis, scabious, amaranthus, dianthus, eucalyptus and magnolia. Another early Monday morning start for me this week to go to New Covent Garden Flower Market. As I mentioned on Instagram, the salesmen there never cease to amaze me at how they’re always so chirpy, considering they’ve got up at crazy o’clock. The rest of the week I’ve been at home, working away in my office on an exciting project. And I can’t wait to share more details with you! So, I hope this weekend’s blog post has given you lots of inspiration. And if you’re involved in Valentine’s Day, I hope you get chance today to recharge before a busy week ahead! P.S. Just in case you missed it, here’s a link to In Season at New Covent Garden Flower Market this month. Loving the overgrown garden wedding trend. Thank you for sharing.